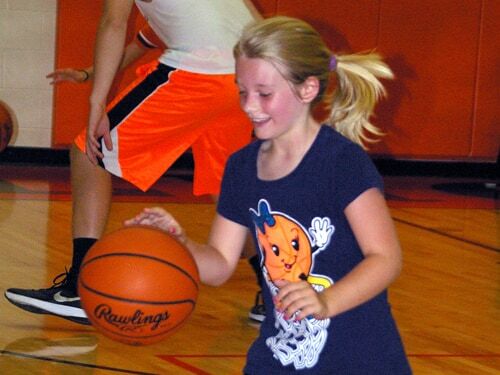 Kaylin Richard dribbles a basketball during Bradford’s youth girls basketball camp. BRADFORD – Patrick McKee had hoped more girls would attend his team’s youth basketball camp this week, but the ones who did learned a lot of good lessons from him and his current and former high school players. About 10 girls attended Bradford’s youth girls basketball camp this week. McKee was really happy with the progress of the girls who did attend the camp. The camp focused on fundamentals with work in passing, dribbling, shooting and defense. To teach the concepts McKee utilized basic drills and also incorporated drills that his high school team uses. McKee was helped throughout the week by current and former high school players. Those players also helped out at the Railroaders’ junior high basketball camp and their junior high shootout.